Windsor Marquees offers the highest standards in marquee hire in the Cheltenham area, priding ourselves on personal service, care and attention to detail. We aim to make your event a perfect and successful event. We specialise in marquees and accessories hiring and our dedicated staff are here to ensure you can relax and enjoy your day, whatever the occasion within Cheltenham and its surroundings. Choosing a reliable, affordable and experienced marquee hire Cheltenham firm is something that for your big, you will be wanting to do, which is where Windsor Marquees tick all of the boxes with our experience when it comes to marquee hire Cheltenham second to none in the area, having operating in the country of Gloucestershire for many years. When it comes to your big occasion and you are looking for a marquee hire Cheltenham company to work with, let us deliver a quote for you, because if you really want the best marquee hire Cheltenham operation then we have the knowledge and experience, not to mention the team, to really make it happen. A mixture of historic and modern buildings make Cheltenham an interesting place to spend a day shopping, socialising or taking in some of the sights in this conservation area of outstanding national importance. Cheltenham became a spa town around 1716 and is home to many things to see and do, including frequently held events and festivals, many tours and sight seeing organisation and if you have time and there is a race on, why not visit the famous race course, home to the Cheltenham Gold Cup. 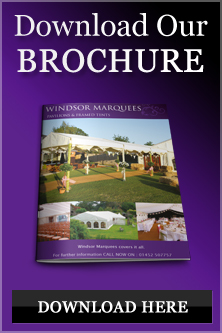 Windsor Marquees have been hiring marquees in Cheltenham for around ten years, serving businesses, leisure facilities, accommodation and entertainment venues with a wide range of marquee and canopy hire. We are able to cater for weddings and other glamorous events and will make sure your perfect day in Cheltenham has a marquee or canopy to be proud of.